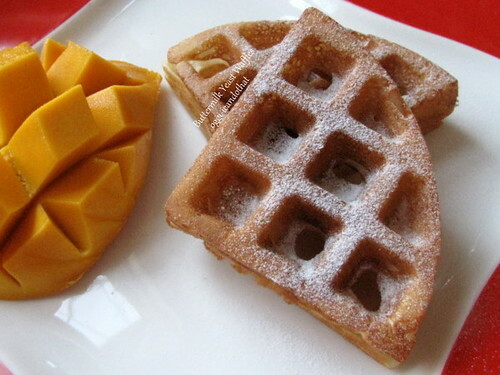 Buttermilk Yeast Waffles ~ I Can Do That! I had homemade buttermilk that had been sitting in the refrigerator for a week and I was not too sure how long it will keep before it gets bad. I didn't want it to get spoiled so I used it in place of regular milk to make yeast waffles. Wow, these buttermilk yeast waffles are very fluffy, airy, and crispy and have a slight very nice tang that I really love. 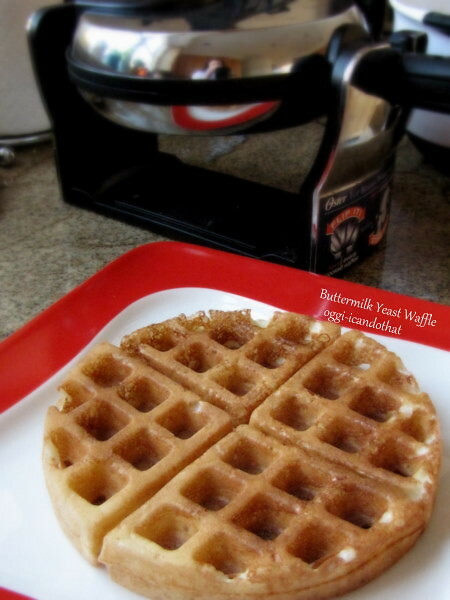 They are simply delicious and way better in flavor and texture than baking powder waffles. And I prefer them without butter and syrup. They are so good just with a dusting of powdered sugar along with some fresh fruits. The recipe has to be mixed the day before baking and needs to rest and rise in the refrigerator overnight, but the wait is worth it. If you don't have a waffle maker, this dough also makes very good griddle cakes or pancakes. In a large bowl, whisk together the dry ingredients. Mix in all the wet ingredients and stir with a rubber spatula or wooden spoon until smooth. Cover with plastic wrap and refrigerate overnight or up to 2 days. Preheat waffle maker and bake according to manufacturer's directions. Those looks great. I have been dying for a waffle making.